DATCP’s Pest Bulletin has been reporting some substantial black cutworm moth flights the last couple weeks from their pheromone trap network and have predicted an anticipated cutting date of May 20th. Although migrating adult populations may not always correlate with field damage, it does provide an excellent warning system and gives us plenty of time to prepare. Black cutworm is the most common cutworm pest species in Midwest corn, especially in late planted fields. However, incidence and severity varies greatly from year to year and field to field. This year it will be well worth your time and effort to spot check corn fields for cutworm activity. Knowing which fields to concentrate on can save time. Although black cutworms can be active in any corn field, they do tend to key on certain field characteristics to lay eggs. Those keys include an attractiveness to soybean residue, significant broadleaf weed growth (especially winter annuals like the chickweed species) and low lying/wet fields. 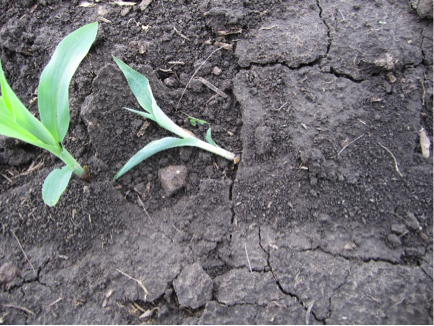 Although DATCP has suggested a May 20th cutting date, you will see signs of cutworm leaf feeding prior to that date. 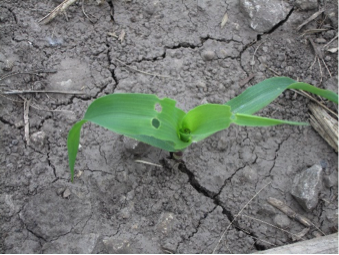 Damage to corn varies according to the cutworm size and the corn growth stage. Small cutworms (first to third instars) can only feeding on foliage. This damage is not considered economic at this point but can be a sign of future stand loss. Mid-sized larvae can start cutting small (V1-V2) corn. If cut above the growing point these plants can survive. 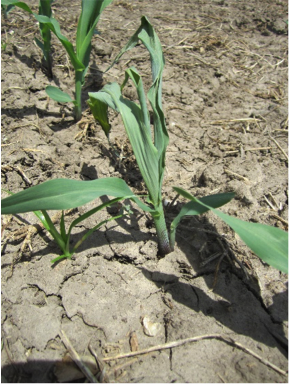 Late instar larvae have a difficult time cutting larger corn (V3-V4 +), instead they will burrow into the base of the stalk below ground. Above ground symptoms are often called “wilted whorl” or “dead heart”. That is, the newly emerging leaves are wilted and/or dying while the older leaves remain green for a while. These plants are unlikely to survive. 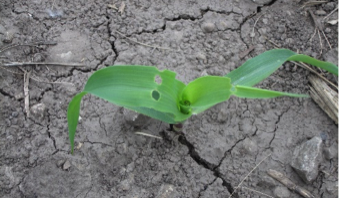 To get an accurate assessment of black cutworm damage, count the number of cut plants in 50 consecutive plants in each of 5 areas of a field and collect 10 larvae. Treatment is suggested when 2-5% of the plants are cut and before the later instars (roughly 1 inch) are present. Although some seed treatments and Bt hybrids may control/suppress black cutworms, when population reach these levels they are not working and foliar controls would be suggested. Knowing the size of larvae is important. Late instar larvae will not feed much longer, and as a result, will not cause significant economic injury. If damage is spotty, spot treatments may be a good option. Black cutworm larvae are grayish-black and lack obvious identifying characteristics. As a result, they may be confused with other insects found in corn fields. Crane fly larvae do not feed on corn but are similar in color. Depending on the specie, crane fly larvae are tapered at each end. Dingy cutworms are foliar feeders and are only a pest when numbers are unusually high. 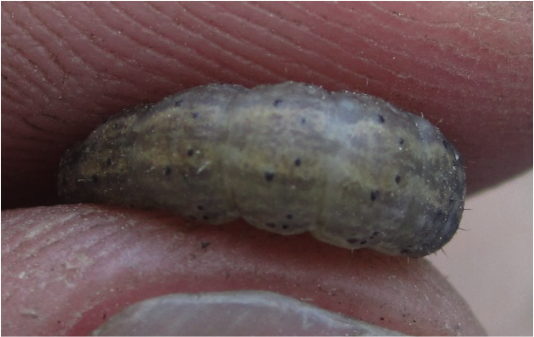 Dingy cutworms overwinter as larvae and these individuals may appear more developed than black cutworms because of their size. However, proper identification can be made by looking at the tubercles (black dots) on their backs. Black and dingy cutworms will each have 4 prominent tubercles (raised black dots)/segment. The tubercles of black cutworms which are closest to the top center of the body of will be 1/2 to 1/3 the size (see picture below) of the other pair. The four tubercles on dingy cutworms we be similar in size.